CHICAGO, Sept. 11, 2018 /PRNewswire/ -- As a job seeker, imagine a mobile app that instantly builds your resume, applies to jobs for you, shows an augmented reality view of job openings at businesses as you walk by and helps you add skills needed for a better-paying job. As an employer, imagine a mobile app that shows you real-time supply and demand trends for talent you need, instantly builds your job descriptions, automatically matches your job openings to candidates who are more likely to respond and runs campaigns to engage them. CareerBuilder is making it a reality. 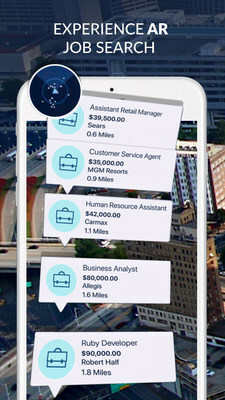 After leading the market in HR technology innovation for nearly 25 years, CareerBuilder is getting ready to launch a mobile experience that leverages artificial intelligence, augmented reality, gamification and hyper-localized search among other groundbreaking features. This exciting new mobile revolution for the dual-sided employment marketplace is an extension of CareerBuilder's end-to-end solutions that cover every step of hiring. "CareerBuilder has put a stake in the ground in wanting to 'own' the mobile experience for talent acquisition and job search," said Kyle Lagunas, Research Manager at IDC. "This is a strategic move and differentiator in the midst of a mobile-first world and complex labor environment. CareerBuilder's investment in incorporating AI and machine learning across their solutions and within their mobile offering is designed to bring a richer, more intuitive experience that expedites results for employers and candidates." Resumes in less than a minute: Leveraging proprietary data science and technology, this AI-powered tool helps job seekers build and store a personalized resume with a few, simple clicks. The tool will also automatically apply to preferred jobs with targeted firms on the job seeker's behalf if desired. "CareerBuilder is tapping into this trend of digital nomadism and delivering a mobile offering for the employment space that is different than anything else on the market today," said Humair Ghauri, Chief Product Officer for CareerBuilder. "We are leveraging nearly 25 years of candidate conversion to help employers and talent connect anytime, anywhere with a deeper mobile experience. We also are helping to provide the modern workforce with the skills they need. Our goal is to mobilize every step of the job search and recruitment journey by creating a mobile revolution across our talent acquisition, employment screening and HCM software solutions." Consultative Intake: Recruiters can be more consultative with hiring managers with an intake tool that features sample resumes of potential candidates and real-time data on supply and demand ratios for desired talent, top markets to find candidates, top competitors and compensation ranges. AI Job Description Building: Leveraging data collected, parsed and normalized from more than 2.3 million jobs, the tool can automatically build a job description when recruiters simply enter a job title. The tool will even account for nuances based on the industry and location. Centralized Candidate Search: Recruiters can view details on all current and past candidates from CareerBuilder products and their ATS in one place, and can export candidates from CareerBuilder's system into their ATS. AI Matching: AI and machine learning technology automatically matches job openings with qualified candidates, zeroing in on candidates who are the most likely to respond based on various signals. Recruiters can also take advantage of semantic search technology that shows related, customizable search terms. Campaign Management & Analytics: Whether it's a fully-branded, customized email or text, recruiters can easily create and send messages to an entire audience of potential candidates. Recruiters can also see in real-time which candidates interacted with their communications and can see how they stack up against competitors in terms of recruiting activity for specific roles. CareerBuilder is a global, end-to-end HR tech company that helps employers hire and manage great talent and helps workers build careers. Leading the industry in innovation for nearly 25 years, CareerBuilder is the only company that offers both software and services to cover every step of hiring. Specializing in recruiting solutions, employment screening and human capital management, CareerBuilder is the largest provider of AI-powered hiring solutions serving the Fortune 1,000. CareerBuilder is majority-owned by funds managed by affiliates of Apollo Global Management, LLC and operates in the United States, Canada, Europe and Asia. For more information, visit www.careerbuilder.com.